This family portrait is typical of the style of painting known as a ‘conversation piece’, which traditionally showed a landed gentry family informally posed in the home or on their estate. This rare, life size, colonial example shows Mary Ann (nee Shears), wife of Captain John Piper, and four of her ten children. Mrs Piper had turned 35 on 2 August 1826, and would appear to have everything that colonial Sydney could offer; wealth, social position, a charming healthy family, fashionable imported clothes and a grand house on the best site in Sydney. Although there are numerous pictures of the exterior of the Piper family home, Henrietta Villa, Augustus Earle’s portrait of Mrs Piper and her children is one of the few surviving views of its interior. For her family portrait Mrs Piper has chosen to wear a sheer, red gauze gown with short, puffed sleeves and a gathered bodice over a long-sleeved, white underdress with a wide, flat collar and tucked edges. The high waist is marked with a belt, fastened on the left hand side with a rectangular gold buckle, above a long, tubular skirt falling to her ankles, its sheerness revealing the pin-tucked bands on her underdress extending from just below her knees. She also carries a white shawl, which may have of borders of ‘broderie anglais’ (white work) embroidery, and wears an elaborate indoor cap, trimmed with ribbons, silk flowers, lace and sheer gauze streamers. Mrs Piper wears several rings on each hand, pendant earrings and a gold watch, suspended from a long gold chain looped up and tucked into a small pocket concealed in the round waistband of her gown. The interests or pastimes of each family member indicated by their clothing and possessions. The children in this image are aged from approximately four to ten years. Thomas Piper (b. 21 September 1816), on the far left, wears a brass-buttoned, black schoolboy outfit, or ‘skeleton suit’, with a white neck ruff and carries an archer’s bow. In the centre of the image the youngest boy, William Sloper (b. 25 August 1822), who beats a drum, is dressed in an unusually tailored, and jauntily militarised, version of the type of frock and pantaloons worn by little boys until they were breeched at about the age of five. The two girls wear identical outfits – coral necklaces with white muslin dresses, their high-waists marked by pale pink sashes – and are shown with more devotional interests; the large book on the stool closest to Eliza Anne (b. 26 July 1818) is perhaps a bible, while the pair of service books lying on the table nearest to Anne Christa Frances (b. 24 June 1820) would be carried to church on Sundays – the Pipers were devout Presbyterians. Mary Ann Shears married Captain John Piper, military officer and public servant by special licence in 1816. It is believed they had met and formed an attached during Piper’s term of service on Norfolk Island in about 1806.This happy family picture must have been completed after the birth of John and Mary Ann’s tenth child, and eighth son Frederick Octavius, on 2 June 1826 but before his death three months later in Sept 1826. 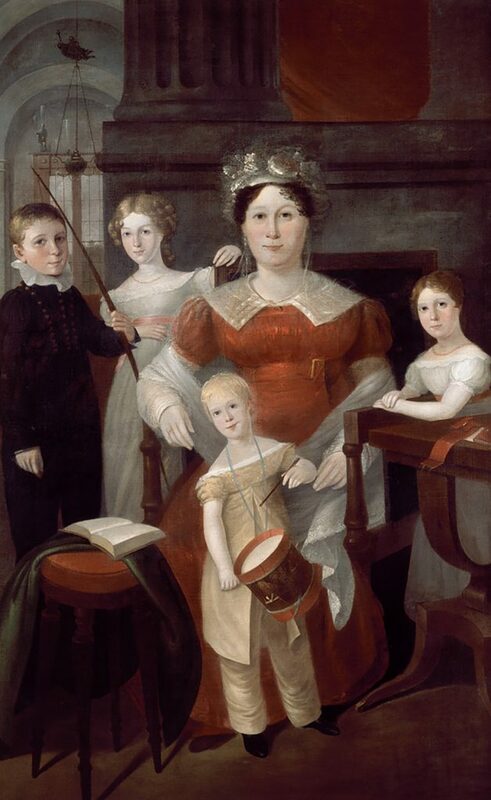 Several other Piper children born before 1826 are also missing from this painting, including Hugh Hewitt Piper (b. 1813) who had been killed in a riding accident on 8 July 1825, which explains why the painting could not have been commissioned in 1825; Ann would never have worn a red dress so soon after the death of a family member. The interior of the building corresponds with the taste displayed in the gardens, and the grand saloon is not only unrivalled in this Colony but would rank high as a chaste specimen of architecture in any part of the world. . . At every turn you see comfort and splendour, and one is much in doubt which most to admire – the elegance of the building as a work of art or the comfort of the house as a residence. The interior of the Villa is filled up in a style that combines elegance and comfort. The principal apartments are a spacious Dining Room, a Banqueting Room and a Drawing Room; all furnished in the most tasteful manner.